Jamaica, Jamaica ah tell yu! Only in JA would a beautiful Ivy League grad not be good enough for some folks as Miss World. The Miss Jamaica World contest went down last weekend in Jamaica. 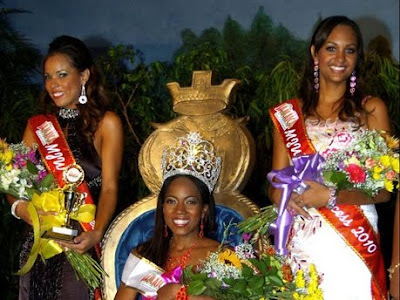 That has always been the 'big one' of the two pageants for Jamaicans, simply because three Jamaicans have copped the Miss World title - Carole Joan Crawford in 1963, Marley mistress Cindy Breakespeare in 1976 and Lisa Hanna in1993. Harvard law grad Chantal Raymond won the competition and will go on to represent Jamaica in Sanya, China later on this year. Raymond seems like an impressive kind of chick. This was her second go-round in the competition, after having entered in 2008 and she was in it to win it this time because clearly she is one of those Type-A personalies that has to excel at everything. But from the comments on the Observer's story on the coronation, not everyone thinks she fits the 'beauty queen' mould with folks debating her shape, looks and of course, complexion. I agree, the runners up fit the visual profile of a Miss World/Universe. Bad choice. Doesn't make sense. It boils down to visual beauty when the Judges choose a Miss World!!! One commenter dismissed other readers who put the criticisms down to colour since Chantal is darker than the two runners-up or than two of the three Miss Jamaicas who went on to win the title. Stop the foolish talk... WE always bringing up this "Oh, I want 1 that look like me..." Then they don't count/place - nothing! Every jamaican represents me in some way... we are a mixed race/culture people. Plus to be fair we have had darker hued and/or shorter haired JA girls represent - Look at Cathy Levy, a woman name McDonald back in the 70s (very dark, with short nappy afro), etc. Now there may be arguments for both sides. No doubt Chantal is not the curviest as her swimsuit pics show. She's got a very trim, athletic frame and flaunted a mean six-pack in the contest. Beauty wise? Well that is in the eye of the beholder and if the eye that's beholding you is Jamaican,you have to consider that country's history and question whether shade plays a role someone commenting about who fits 'the visual profile' for these contests. Did Mpule Kwelagobe (Miss Universe 1999) fit this visual profile perchance? I'll leave it up to you islandistas to decide. Does Chantal have a chance?